"It was a big change moving back to the Standing Rock Reservation. When I lived in Phoenix, I had access. It was convenient just to go down the street and get whatever I needed. But when I moved back here, we found ourselves having to drive an hour or so to the border towns like Bismarck, N.D. or Mobridge, S.D. to do our grocery shopping. We spent a lot of time, energy, and money doing that because there isn't a lot of local shopping here. There's a fast food place and Quick Stops where you get gas and a quick snack. Fresh, locally grown produce just wasn't available... but that was 10 years ago. This is changing now." Aubrey Skye is proud of his heritage as an enrolled member of the Standing Rock Sioux Tribe. For some years he attended boarding school and lived in Phoenix, but ultimately he felt the call to return home to the Standing Rock Reservation. Good things are happening on this land that spans the North Dakota-South Dakota borders. Aubrey works for the Standing Rock Sioux Tribe's Diabetes Program and is helping in the fight against diabetes. In 2002, a study on hunger in Indian country found malnutrition and diet-related chronic diseases in American Indians on the rise — meaning that some or all nutritional elements necessary for health were missing from the diet, according to International Relief and Development. In 2005, the Center for Disease Control reported that two counties on the Standing Rock Reservation had the highest diagnosed rate of diabetes among adults 20 and older. In 2008, the Journal of Nutrition reported that not having access to nutritious food directly translates into poor nutrition and diets lacking in vitamins, minerals, fruits, vegetables, grains and meats. The IRD study found that the malnutrition on many American Indian reservations is comparable to that found in some developing countries. The hungry and malnourished aren't all thousands of miles away — some are in our own backyards. Aubrey understands just how much the Native American diet has changed and how, as far back as the 1950s, they began to see the onset of type II diabetes among Native communities. "It was all due to the change in our diet." This is why, for two years running, Aubrey, as the Diabetes Program's Native Gardens Project coordinator, has taken on a huge garden project for the reservation. More than 130 families on the reservation wanted to raise gardens. Through a program of National Relief Charities — American Indian Relief Council's Project Grow — their gardens were tilled and a variety of seeds, including traditional seeds, were provided to get their gardens started. Aubrey was first introduced to gardening and agriculture through his stepmother's family. They grew organic crops, but didn't call it "organic" back then. Each year, they burned off the weeds because the ash added nutrients to the soil. Aubrey followed the tractor to sow the seeds and cover a row at a time. It paid off every year. "This garden project is a holistic approach in the prevention and treatment of type II diabetes in our communities on the Standing Rock," Aubrey says. "The project is creating awareness of the benefits of having fresh produce on a rural reservation that really doesn't have access to this type of food." Aubrey, the SRST Program, and the AIRC Project Grow are raising awareness about the health benefits of the traditional foods that the Native people have depended on for generations. Coordinating the tilling of more than 130 gardens is no small task on the Standing Rock. The reservation is wide. It's miles from one place to another. Locating the homes of the people who want the garden plots is also tricky. "It's like... turn left at the telephone pole, go two miles to the end of the field and take a right, and go a mile and a half and you'll see a trailer out there," Aubrey says. This is what Aubrey has to go by, but it's easier each year as he and his crew become more familiar with the families and their homes. Aubrey coordinates the tilling with the families and the support from AIRC. "AIRC provides the equipment and the fuel for the tilling, the seeds, and some manpower to help us till more than 130 gardens in a week's time — just in time for the planting season," Aubrey says. Aubrey helps with the tilling too. "It's really good to see all the services that AIRC and NRC provide, and if it wasn't for their donors, we wouldn't be able to carry out a lot of the objectives that we have." Aubrey's garden project is working on many levels. Gardening was a big deal back in the 1930s to 1940s before the Army Corp of Engineers built dams and flooded the Missouri River bottom where Standing Rock people lived. This forced the tribe to move farther back on the prairie. The soil, Aubrey explains, is basically buffalo range — all grassland — but gardening can be successful and the people here are interested in making it so. A big motivator for the gardens, aside from the health benefits, is self-sufficiency. Although root cellars disappeared from American households in the last century, the people of Standing Rock are now using them to store fresh vegetables, potatoes and other crops into the winter months. "This reduces our dependence on commodities and gives our families a way to provide for their own basic needs," Aubrey says. Aubrey also sees that the elders of the tribe are aging. The gardens are a way to get several generations involved for a common goal. This gives them a chance to pass on their wisdom and for younger generations to learn the old stories and traditions. "They have the knowledge and seem to be always willing to talk about their experiences. This helps all of us," Aubrey says. 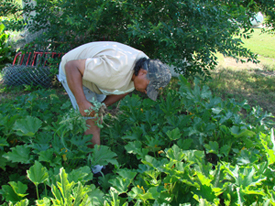 In addition to the garden project, Aubrey, the SRST Diabetes Program, and the CDC Native Diabetes Wellness Program are encouraging tribal members to eat wild edible foods and to vend these foods at the three farmer's markets on the reservation. Native Americans once made their living and got all of their sustenance from game and wild foods. Modern day raw foodists believe that wild edible foods are the most vital of all foods. "These are traditional foods that we used to eat all the time," Aubrey says. The foods — timpsila (wild turnips), chokecherries, buffalo berries, wild currants, gooseberries and others — grow abundantly on the reservation and provide a sustainable source of variety in the diet. "We are working toward ways to be more self-reliant and more green," Aubrey says. "The whole point of our garden project with AIRC is to provide locally-grown foods to tribal members so they have access to healthy foods. The garden project is motivating our people. We're going to do it again this year, and we hope, we'll have continued success with the garden vegetables, the farmer's markets, and our return to traditional foods. These are all stepping stones in our fight against diabetes."